This article originally was published in 2007 (!) but adjusted for relevant details annually. I’m a bit late posting it this year, so pay particular attention to the tax loss selling tip as the deadline is fast approaching. It’s that time of year again. I’m not talking about Christmas, I’m talking about the year end coming up for personal income taxes. Personal taxes is probably the last thing on your mind, but it’s likely your biggest expense! 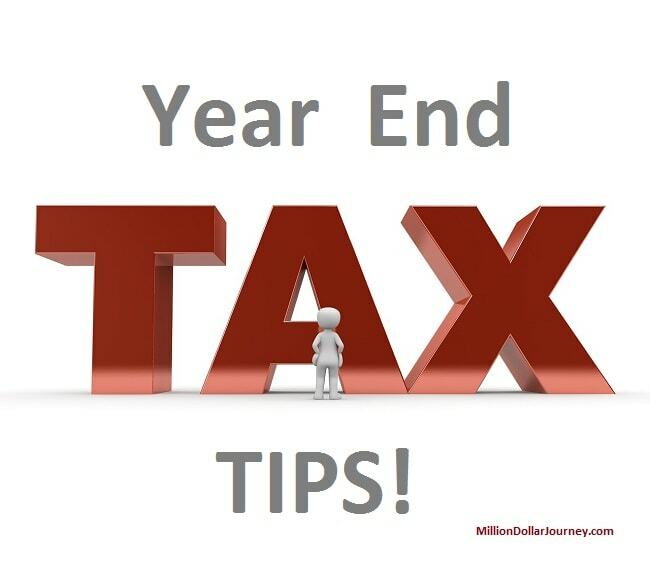 In the spirit of reducing expenses, here are some year end tax strategies to consider. Tax Loss Selling. If you have taxable capital gains this year in your non-registered account, you may want to sell some of your losing stocks. Why? The realized losses will offset your gains, thus reducing your taxable amount. Capital losses can also be carried back against capital gains accrued in the previous 3 years and carried forward indefinitely. Make sure you do this by December 23th though as it takes 3 business days to settle your trade. Frequent Trading Record Keeping – If you frequently trade in a non-registered account (I have a fun trading non-reg account), you are responsible for tracking your capital gains and losses. This can get tricky if you frequently buy/sell partial positions as you’ll need to track your adjusted cost base. You can do this manually, but in more complicated cases you can use an online app like adjustedcostbase.ca. I started using it this year, and it seems to work well. Be Patient when Taking Stock Profits. If you want to take profits in a stock (in a taxable account), wait until the new year. That way, you’ll have a year of tax deferral. Charitable Donations. You have until Dec 31 to make your charitable donations in order for it to count under the current tax year. Also when you file your taxes, make sure you file all the donations under one person. Here is an article on how the donation tax credit works. Donate Stock instead of Cash to Charities. It may be a bit late for this now because of processing time, but if you donate stock to a charity instead of cash you’ll get tax bonuses. The tax regulations now state that stock donated to a charity will not face any capital gains taxes AND the contributor will receive a tax receipt for the amount donated. Check out my article on “Charitable Donation Tax Credit Strategies” for more information on how to maximize this tax rule. Moving your TFSA – If you are considering moving your TFSA to another institution, December is a great time to do it. Why? Say you have a TFSA with a high interest rate savings account, but you’re now looking to move the money into a low cost trading account. The drawback is that there could be fees associated with transferring funds directly from one institution to another. In addition, if you contribute to a TFSA then withdraw and redeposit the funds in the same year, you could possibly over contribute and face hefty penalties. To avoid the dreaded fees and over contribution rules, simply withdraw the funds from the institution in December to maximize interest gains then wait until the new year to deposit the funds into a trading account. Problem solved! Private Corporation Dividends – For you business owners out there, if you expect to have a personal tax refund this year, you may want to pay yourself a dividend to as a way to pull money out of the company without paying personal tax out of pocket. We pay enough out of the company to reduce our personal tax refund to close to $0. Alternatively, if a dividend would result in personal tax payable, consider holding off until January as you would have another full year before paying the taxes due. Do you have any tax tips? Please share in the comments! This might be common sense, but in addition to filing all donations with one spouse, one should file all donations under the higher tax paying spouse to maximize the tax savings! Merry Christmas CD! It actually doesn’t matter which spouse you claim it under as it’s not dependent on the tax rate of the spouse. The first $200 of donated amount is given a refund equal to the lowest tax bracket in your province, and the rest is given back at a rate equal to the highest tax bracket. Thanks FT for filling that one in. It’s much like the public transportation deduction credit. It all comes “off the bottom” so unless one spouse is pushing close to 10k it doesn’t really matter who takes the credit. Of course, I really like the stock donation idea. However, I wonder if it results in the charity getting dinged instead? The government likes to get its cut, so is this a real loop-hole? The charity is a non-taxable entity, therefore when they in turn sell the stock position, there is no capital gain taxes to be paid. They get to keep the full proceeds from the sale to run their operation. The charity does not get dinged. Also, with selling stocks to claim the capital loss, be wary of the superficial loss rules. They’re much too detailed to go into here, but if you are selling losers, I recommend that you be aware of those rules. Keep organized! Keep a file for receipts for kid’s sports activities. Up to $500 a year is tax decidable for each kid. Also keep any receipts for medical expenses that you couldn’t otherwise claim. If you are self employed claim every business expense, even the small ones. It adds up over time and makes a big difference. It’s also a great time to buy RRSP’s (on sale now!) which makes for more deductions. Its my understanding that if I transfer stock into an RRSP (or next year a TFSA) there is a deemed disposition. Does this mean that I can get credit for a tax loss without selling? I could very likely be out to lunch here. Just looking for others thoughts. I agree with Kathtyn, keep organized!! If you are not already doing so, the best thing is to get a bunch of folders for each person in your house and compile receipts and documents that you will need. This will help once you get to your accountant. Also, when it come to tax time, I always speak with my accountant who I have probably had since the age of 16 (and my parents used before that), this way I have built a relationship and can get latest tax advice and money saving tips that I might not have thought of myself. Reverend, if you transfer stock to an RRSP, you have to pay capital gains tax if there are gains. However, you cannot claim capital losses when transferring stock to an RRSP. Best thing to do in that case is sell the stock, claim the loss, and transfer the cash to your RRSP. Thanks FT. You’re a wealth of knowledge (and incredibly prompt). Slightly different topic… If you have a large investment loan and paying a high interest, is there a maximum of the tax deduction you can claim? I’ve heard that no matter how match of interest you are paying, you can’t get more than $30K as a tax refund after claiming the tax deductable interest. I always make a point with my small business of going out and buying a whack load of office supplies in december so I get the writeoff on my december year-end and use of the supplies well into the next year. My wife’s employer also gives her the option of receiving her bonus Dec 15 or Jan 15 which gives us a little more latitude for tax planning as well. Acorn, I haven’t heard that rule, but you’d need to have a mega loan to have $30k as a tax refund. In order to accumulate $60k in interest, you’d need a $1.5 million loan @ 4%. I have a question related to capital losses, so far no one has answered this question, lets see if this fourm is able to. Back in 2000 when IT bubble burst, I lost about 12K in the stock markets. Since this was about 7 years ago, how do I report this to the CCRA so that any future capital gains can be used against those losses. G, providing that you sold the stock already and reported it to CRA, you can carry forward your losses indefinitely. If i contributed $50 to a charity in 2007 and I did not claim it then. Can I add it to my donations for 2008 and declare it together or do I have to go back and edit my 2007 return. FT, I have already sold the stock. How do I report this loss to CRA? rocket spanish, I’m not sure what you would do in that case. It would be best to consult a tax pro. georumble, if you sold it this year, then you can simply include it in your return. If you sold it in a previous year, did you report the loss on your tax return? If not, you may need to ask an accountant how to report a loss from previous years. Thanks Ft for your answer, another good way to reduce your tax bill is to donate to a political party you like. The political tax credit is quite sizeable and if you are someone who is interested in politics like I am it is almost like you are getting paid to support your political party. If you live in Canada, you can save up your charitable donation deductions for up to 5 years. The first $200 is at a lower rater. After $200, the rate is higher. It’s best to save them up for a few years if your yearly donations tend to be lower than $200. In your case, just claim it on for 2008 or save it up for a few years if you plan to donate more and claim it in 2009 or 2010. A good idea might be to pick up stocks which were oversold due to tax loss harvesting..
Further to your comments of 17Dec.08 to “The Reverend”, can you repurchase within 30 days the same company shares that you sold and reinvest the cash proceeds into a TFSA without invoking the Superficial Loss Rule? – My brother didn’t get to file his taxes for 2007 and we are wondering whether we can file it this year with 2008. How do we go about doing it? Madusha, I think you can file for 2007 along with 2008. I would check with the online tax filing sites like quicktax and ufile. Check out more about the home renovation tax credit here. perhaps this deserves it’s own article but what about selling when it comes to mutual funds before their year end distributions? Does it make even more sense in a nonregistered account to sell them at a loss and before you are entitled to receive income in the form of capital gains and interest and dividends? I’ve heard one of the downfalls of holding mutual funds that distribute income is that you get the full tax hit even if regardless of what time in the year that you purchased them. Thus you buy in November and your distribution income is not prorated meaning you have to declare a year of income from the fund. Flies against conventional wisdom to defer taxes as long as possible. Regarding the HRTC. The program will only be running one year… however it the year is not a calandar year. I believe that all expenses you incur before February 1, 2010 will be eligible to be claimed on your 2009 tax return. However there will not be any claim you can make for 2010. FT it only matters what spouse you claim the tax credits on to the extent that each spouse would have the 200 of credits at the low tax rate before they could start claiming at the high rate. Rocket Spanish, if you are still reading, you could file a T1ADJ for the 2007 tax year to claim the donations. The adjustment can be done online in very little time if you have the e-pass set up. If not there is a one page form to file (T1-ADJ) which can do the same thing. This is the proper way to claim a donation from a prior year. georumble, my answer above applys to your situation. cannon_fodder, you are right that mutual funds will often record their distributions at the end of the year. So it might make sense to ensure that you sell mutual funds before the end of the year. However, if the capital gain is large enough, then it might not be wise. FT: typo. #3. should be 2009 tax year, no? Thanks for the heads up Nobleea, fixed! having the HRTC extended for another year would be sweet. we maxed out the 2009 version in June sometime. we’d max out a 2010 version as well. So, my question is: Her broker is saying she can claim capital loss from it. I’m confused, I thought from inception to sell, and if the growth is positive, that will trigger a Capital Gain. How is it a capital loss? Am I not seeing something here? @ Kinny – yeah that doesn’t add up to me either. You should ask a tax accountant about that, because unless you cash out you don’t need to state it when you file tax. Yes, timely. And for those who are able to take advantage of any government incentives, get the folder organized! @Marc: Lucky for US citizens..Canadians don’t have FSA. @ Kinny: the broker is wrong. Her basis is her initial cost, $5,000. She’ll have $7,000 of capital gains to report when she sells it. Doesn’t matter that it peaked at $18,000. I work for a charity and will confirm that the charity does not get dinged with gifts of securities – we think this is a great vehicle for giving, and will happily accept gifts of any amount. Also for most charities it is not too late – this is our busiest time of year and most charities will remain open through to the 31st for the purpose of facilitating gifts. Call or visit their website, they will usually make a securities transfer form widely accessible. The date of the gift in the case of a gift of securities would be the date at which the change of ownership took place. Once your broker is notified, this usually happens within 24 hours provided it is a business day, likely you can do this as late as the 30th. @ Kinney: Very possible for there to be a capital loss if it is in a non-registered account for the last fifteen years. She may have had taxable distributions, increasing her adjusted cost base. If the current market value is lower than her adjusted cost base, then she would have a capital loss if she sold. She should have an accountant check this out for her. We upped our charitable donations in a big way by investing in our community via charity. ROI will be over 35%! If you are going to contribute to Spousal RRSPs for the 2010 tax year, do it before the end of 2010. That way you cut off 1 year from the 3 year attribution rule (if you needed to withdraw from them in the short term). What are the tax implcations of canadians daytrading US stocks? Nice tips! I like the idea of donating stocks instead of money. Never tried it though. Did you? Why would a TFSA transfer count as an overcontribution ? If you can prove that one account was closed and another opened in a different institution, in theory there should be no problem. Mutual funds do payout distributions near year end. If you reinvest the distributions, they are added to the cost base. This accumulation over 10 plus years can significantly increase your cost base. When you sell the mutual funds, the capital gain or lossis based on the proceeds minus the cost base. This could result in a capital loss, if the proceeds of the sale was less than the current cost base. Depends, the proper forms need to filled out when transferring assets from one TFSA to a new TFSA. If not done properly, CRA views it as a redemption and then a contribution. Great tips! Tax selling losses is especially relevant with how much the TSX has plunged as of late. Although this is only a good idea if you’re selling non-registered investments. I really like the idea of donating stocks to charity. Great financial move. Good idea regarding the part about moving your TFSA. My husband and I donate a lot of money each year and he was actually just telling me about the benefits of donating stock rather than cash. Whenever I donate (always online), I have never seen an option for donating stock. Do you know whether a minimum is required? And is it only certain organizations that accept this option? Hi Jess, not all charities accept stock. However, to find out, you’ll need to contact the charity directly and arrange for the transfer to happen. This will involve you calling your brokerage to set up a transfer to the charity brokerage account. Gotcha! Thank you for that. I am really intrigued by this option. These are great tips to ensure that we pay less taxes and who wouldn’t want to do that? I often take this to the next level by contributing to my TFSA and RESP when the calendar turns to January. More time to compound my money. Quick one that I don’t see covered here, I had a windfall in 2016 and I’m wondering if the best thing to do would be to stack it all into my RRSP (I have lots of space). Speaking to my accountant I would be able to get nearly 50% back against taxes paid this year, then I could play with the return elsewhere next year – I’m quite keen on setting up my own trading account as per this blog, but haven’t quite got the courage to start yet. Next post: The Best of Million Dollar Journey: 2016 Edition!